In a large, heavy-bottomed pot sauté green onions in 4 tablespoons of olive oil. After onions have softened and cooked down add 2 cloves of crushed garlic and cook for an additional minute, stirring frequently to prevent garlic from burning. Add arborio rice and salt to pot and cook over medium heat for a few minutes, stirring continuously. Add enough vegetable stock to cover rice and simmer over low heat stirring until the rice has absorbed the majority of the stock. Add additional stock and repeat until rice is nice and creamy and no stock remains. Continuos stirring is required and SO worth it for the creamy rice at the end! Add english peas to rice for last 2 minutes of cooking, tasting for doneness. oh, man, sarah. i can’t believe you stood over the stove stirring risotto in the desert heat! you are a champion! 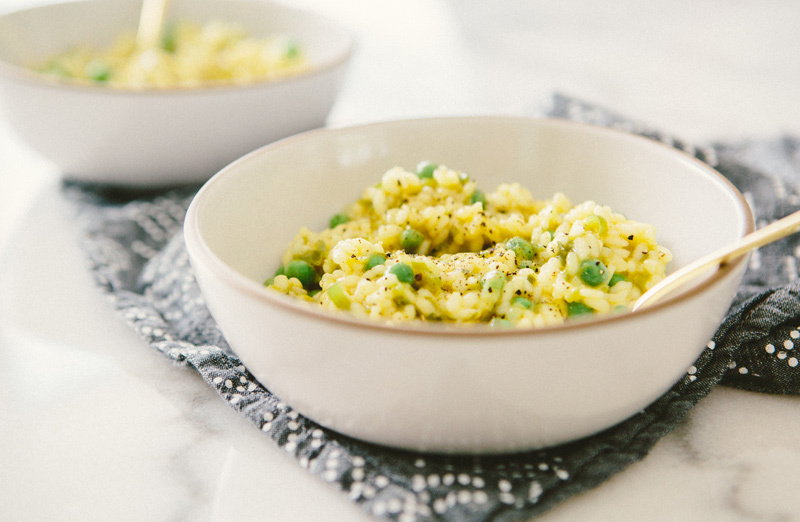 I usually hate peas but this dish looks seriously delicious! Thanks so, so much for this recipe! 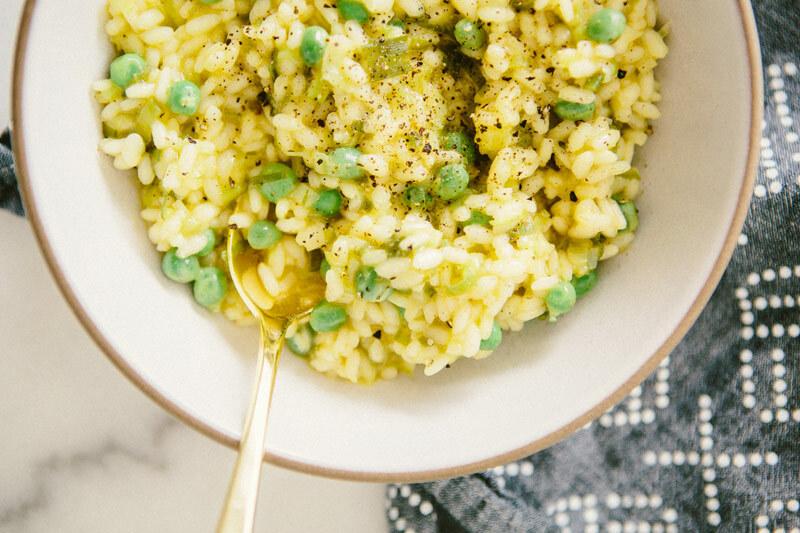 I adore the texture and idea of risotto, but I can’t eat cheese, so most recipes leave me out. I am a huge fan of risotto. In the fall I love making a butternut saffron version but I love the idea of peas and green onion for the warmer months! Oh wow, that’s a bowl full of cozy right there! 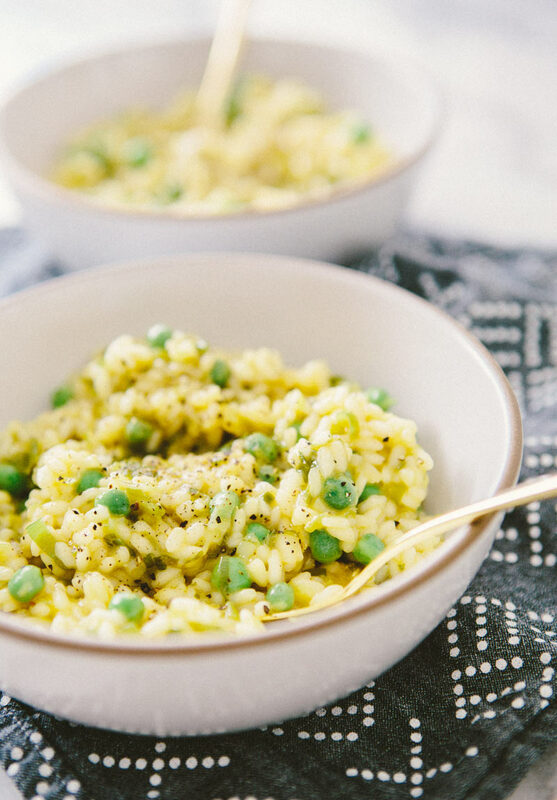 For some reason risotto intimidates me so I’ve never made it, but this looks too good not to try. We have a bunch of arborio rice left over in our pantry from a recipe. Glad to have a way to use it up with this recipe! Delicious recipe! Looking forward to trying this. this probably has to be the prettiest looking risotto i have ever seen.. the vegetarians in my household will definitely appreciate me making this dish. thanks for the recipe! I made this last night and it was delicious! I used frozen peas and still was good! The peas give a pop of sweetness. I added quite a bit more salt than the recipe called for and a tiny bit of dried thyme. Will definitely make this again! Thanks Sarah! I made this last night – it was so creamy and delicious and my husband couldn’t believe there was not butter or cheese in it. The fresh English peas give it a nice crunch. It did take a long time to stir the broth in (40 min?) – does it typically take you that long? 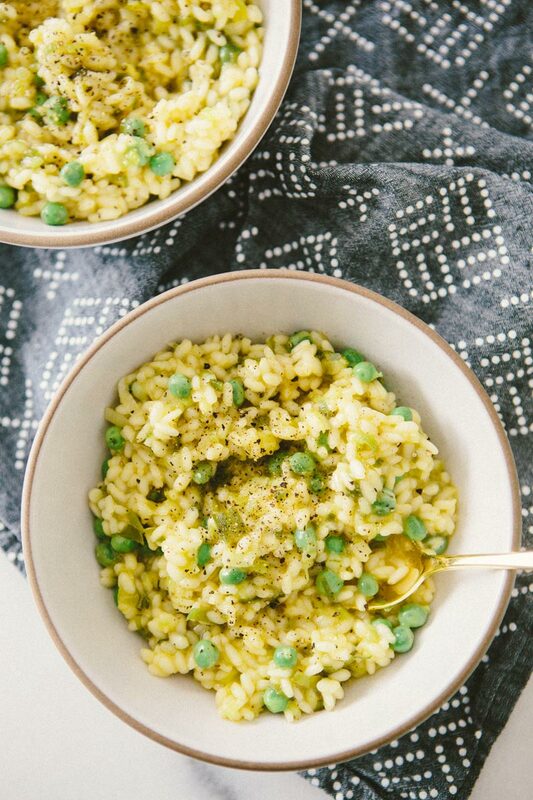 Any tricks for getting the risotto texture perfect? This was the first time I made risotto so I’m a novice. 🙂 Thank you so much for this great recipe, we will continue to make it again and again!